Supplies Shopping | Barbie Who? Today was a pretty good day! I went into town for a doctor’s appointment, and while there the kiddo and I went shopping. I have to make the best of the long drive, after all. I wound up going to a few thrift stores, but we didn’t find any new dolls. My husband thinks this is a good thing, but I was bummed. I had such good luck finding dolls last year! Where are they hiding in 2015? One fun thing we did find were a few board books. My daughter enjoys looking at the pictures and having me read them to her. I was happy to find something she gets so much joy from. The books kept her occupied as we ran errands in town, and that alone was worth the dollar we spent on them. Plus they will continue to entertain at home. Everybody wins! My last stop of the day was to the hobby shop. I spent waaaaay too much time just browsing the shelves for fun new things. I was very tempted to buy a yarn winder. I keep seeing them on Facebook and everybody seems to love them. I couldn’t really justify spending $50 on an accessory, so the yarn winder is still on the shelf. However, I did spend $4 on a new set of knitting needles. I wanted to buy a standard pair of 2 mm knitting needles, but the smallest size our local hobby shop carries is 5 mm. Luckily, they did have a set of double-pointed needles in the size I need. Because the things I create are generally small, I don’t see the DPNs being a problem. 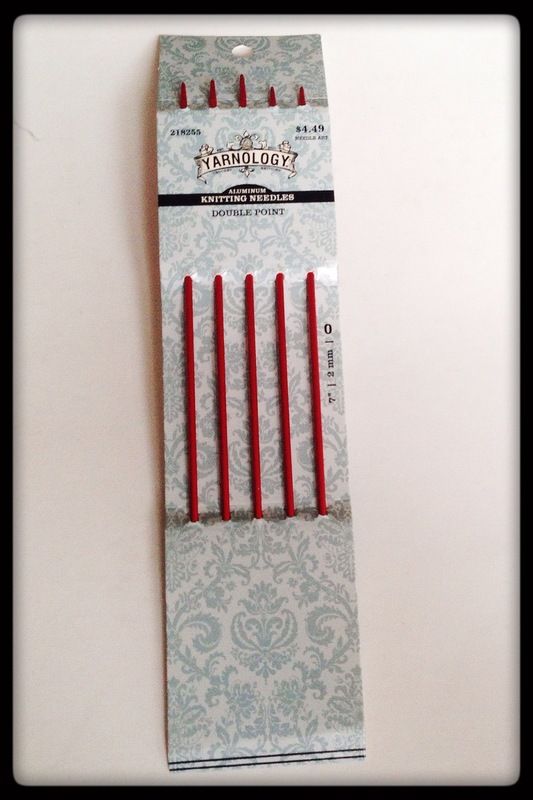 The needles I bought are made out of aluminum and are in a fun red color. I can’t wait to break them in! I plan on using point protectors if my work slides off. Right now, I don’t have a set that will fit well on these tiny needles. It is on my wish-list for the next time I made it to the hobby shop. Now that I have a proper set of needles, I really want to knit something with them for the blog. I have been looking at different knitting patterns, and I am very close to deciding on the next doll for the blog. I have narrowed it down to two candidates. My first choice is to do Donna in her wedding dress, and right now the only thing keeping me from choosing her is my inability to find my size 10 white thread. I found some size 30 white thread, but I can’t see myself making something that large with such fine thread. If I don’t find the proper thread by tomorrow, I will just go with the other option and wait for the thread to turn up on its own. Trust me, nothing makes a lost crafting item appear than moving on to the next project. Anyways, I will make a decision and post my plans very soon. Until then, cheers!